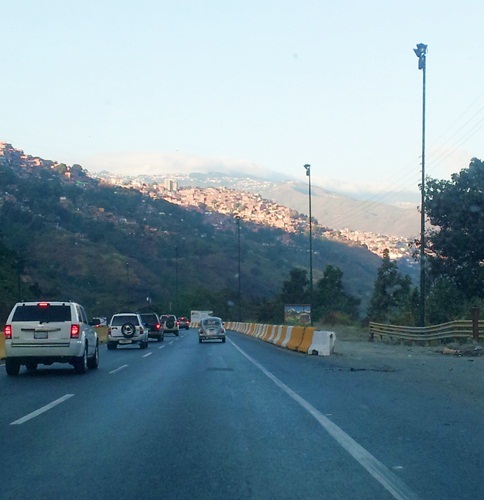 My journey from Canada to Venezuela and everything else in between. 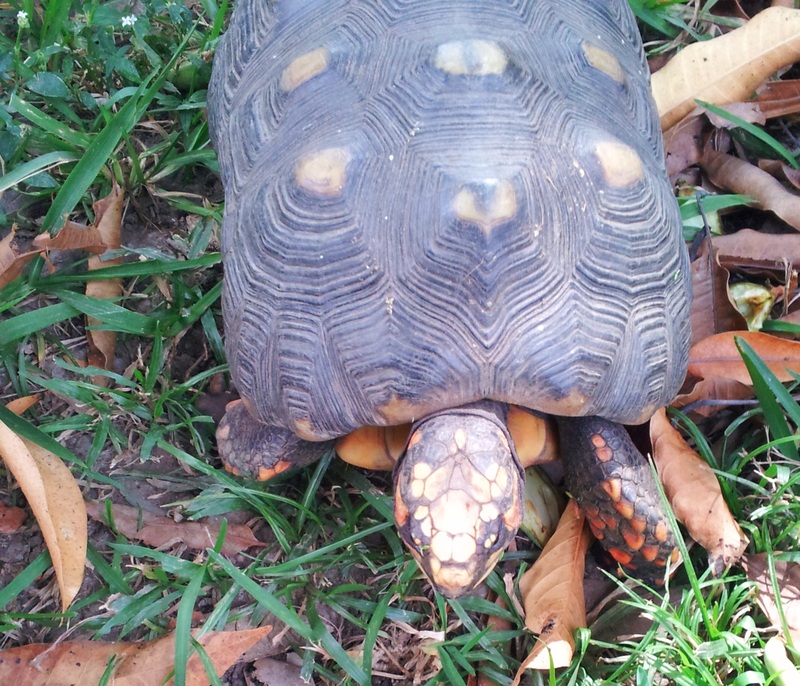 I am sure that the turtle can teach you a better way than the hare. This quote is awesome! What a simple reminder to slow down and enjoy the journey. I love the beach. I love that I can be lazy. I love that I don’t have to think about anything. 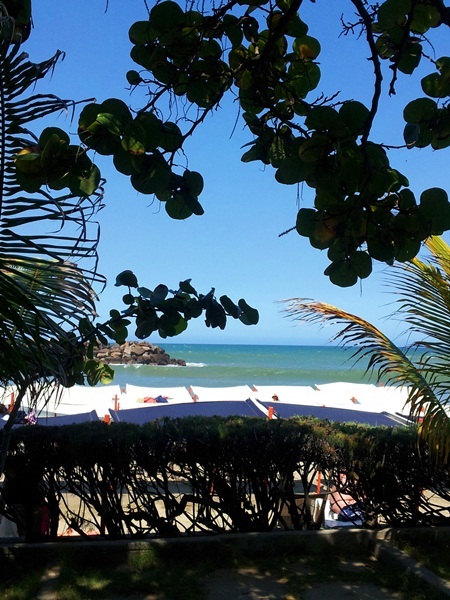 This weekend we had an opportunity to slip out of this craziness called Caracas and head to the sandy shores. Like a horse with a carrot dangling in front of its nose, I stayed focused. I planned and I checked things off of my list: beer, check, sunscreen, check, plantain chips, check, towels, check, cooler, check. We were set. We needed to leave early Saturday morning to beat traffic. How early you ask? 6:30 early. I know, good thing we’re morning people, right? Now in reality, the beach isn’t far, but the traffic plays such a crucial role here that a 45 minute drive can take well over 3 hours. For the most part we were lucky. There weren’t any accidents and we made record time, just under an hour and a half. Everyone has the same idea. Get out of town! After stopping off to get some empanadas and some well needed coffee, we dropped our stuff off at our friend’s condo and were on the beach just before 9. I understand how people love sunsets on the beach, but I prefer the mornings when the sun isn’t too strong, the beach isn’t crowded and the birds are searching for their breakfast. The view from our friend’s condo. Now I’ve been to enough beaches to know to apply sunscreen, but for some stupid reason I almost always forget to put it on one part of my body and at the end of the day I’m left scolding myself. I carefully applied the cream over my body, paying specific attention to my ankles (the former victims of my negligence). After waking up from a little snooze. Yeah, I had a nap…tee hee. Life is cruel, isn’t it? Don’t envy me yet. I discovered that unfortunately, this time was no different. I burnt my knees! Seriously, how did I miss them? They’re round, bony little things. Sigh. I think I need to make a check list for future applications. Like a child, I was quickly distracted from my pain when I saw a vendor passing by selling jewelry. Normally I don’t ask them to come over because I feel bad if I don’t buy anything, but something blue caught my eye and I needed to see what it was. It was a pretty bracelet. I asked the guy to see it and he was obliging. Out of the corner of my eye I saw one with shells and some colored things that looked like little buttons(they turned out to be dyed coconut shell). Anything natural with texture and color and I’m in. 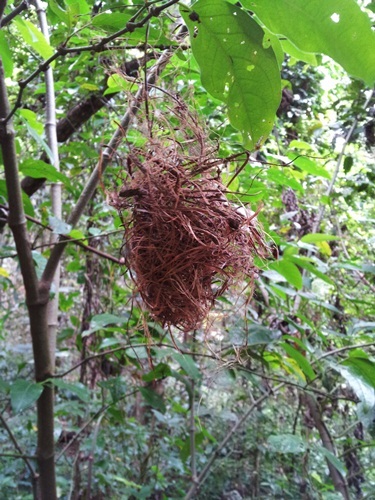 I think the most precious of art comes from nature or is at least inspired by it. I disregarded the first and focused all of my attention on the smooth shell creation. I tried it on and wasn’t at all surprised to find out that it was huge. I have child sized wrists. The guy said he could adjust it and sure enough he pulled out some scissors and a lighter. I put it on a second time, but for some reason I couldn’t figure how to remove it. He took it off of my wrist and told me that he’d make it better, prettier. 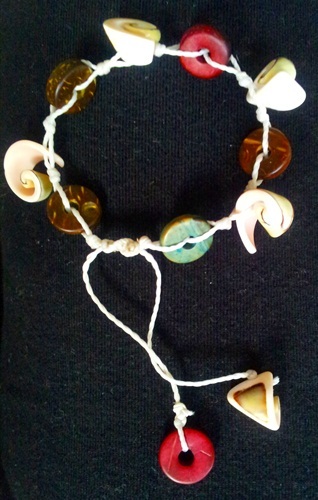 After settling in the sand to redesign my bracelet, we offered him something to drink while I keenly watched. He deftly thread the pieces on the string and tied knots at an amazing speed. His final design was simpler and indeed prettier than his last. I get so much joy when I look at it. I know it sounds weird. How can something that cost around $5 bring a smile to my lips? It’s difficult to explain. I get the same feeling when I’m in the woods staring at the leaves of a tree. One thing I know for sure is when I wear it I’ll remember him, the beach, the sun, but more importantly, it’ll act as reminder that the the simplest pleasures can be found almost anywhere. All great things are simple, and many can be expressed in a single word: Freedom, Justice, Honor, Duty, Mercy, Hope, Smoothies. Juan’s mom and I made a quick trip to the fruit and veggie market the other day and while we were meandering around we came up a fruit I didn’t recognize. This is pretty common for me. There are lots of tropical fruit that I have no idea what they are. 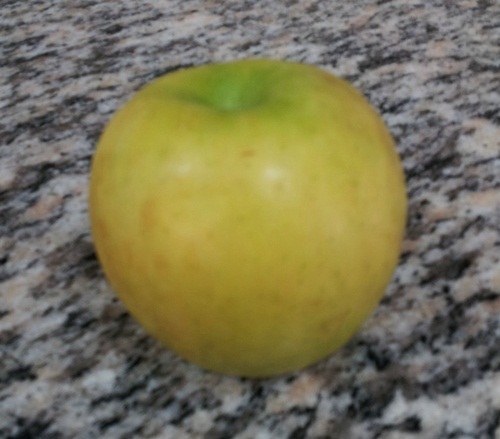 It wasn’t the pear shape that interested me, nor the yellow color, it was the aroma. Now when I say aroma what I really mean is the drug like effect it had on my senses. No word of a lie, this fruit has an euphoric effect. 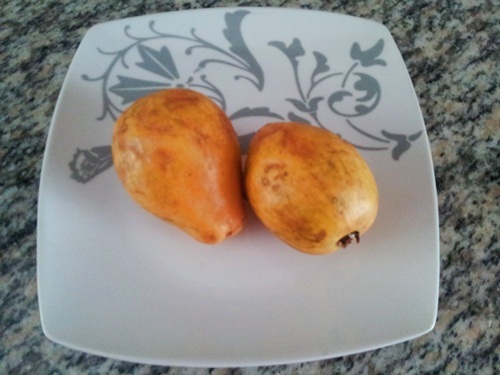 Guayaba or guava in English. My new love! 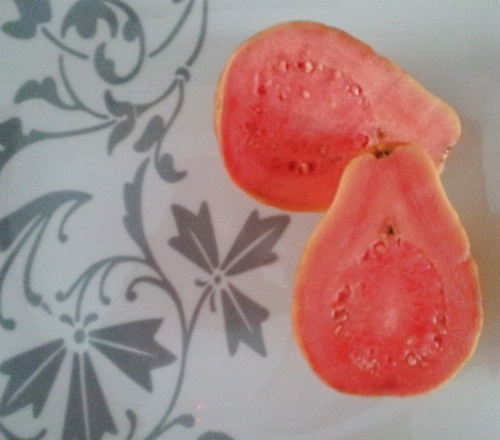 The new focus of my desire is called guayaba, or in English guava. I’ve tried it before in a jelly fruit candy. The smell isn’t the same, but I had a general idea of the taste. Anyway, for the rest of that morning we drove around with them in the car and all I kept thinking was, this could be bottled and sold as a natural anti-depressant. Well I guess eating them is easier than bottling and the nutritional value is outstanding! 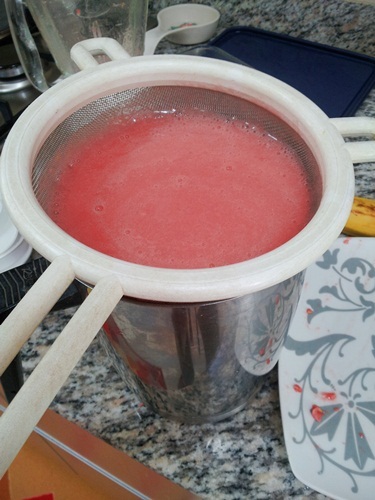 I decided to make a batido (or a smoothie). I cut the fruit length wise and cut them into cubes, like I do with mangoes. This by the way, is the wrong way. Juan’s mom came into the kitchen and told me that I needed to peel the skin like a potato and then cut it into smaller pieces. I was just going to throw everything into the blender willy nilly, but this is also incorrect. 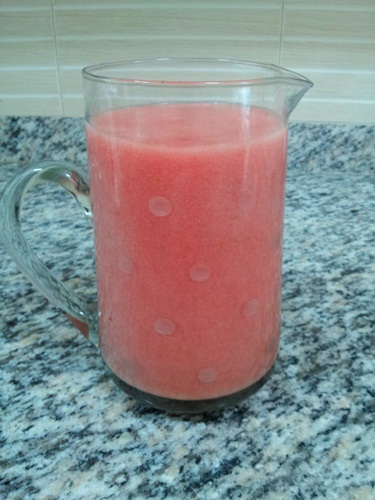 After cutting the guava and placing it in the blender, you need to add a lot of water and blend on high. 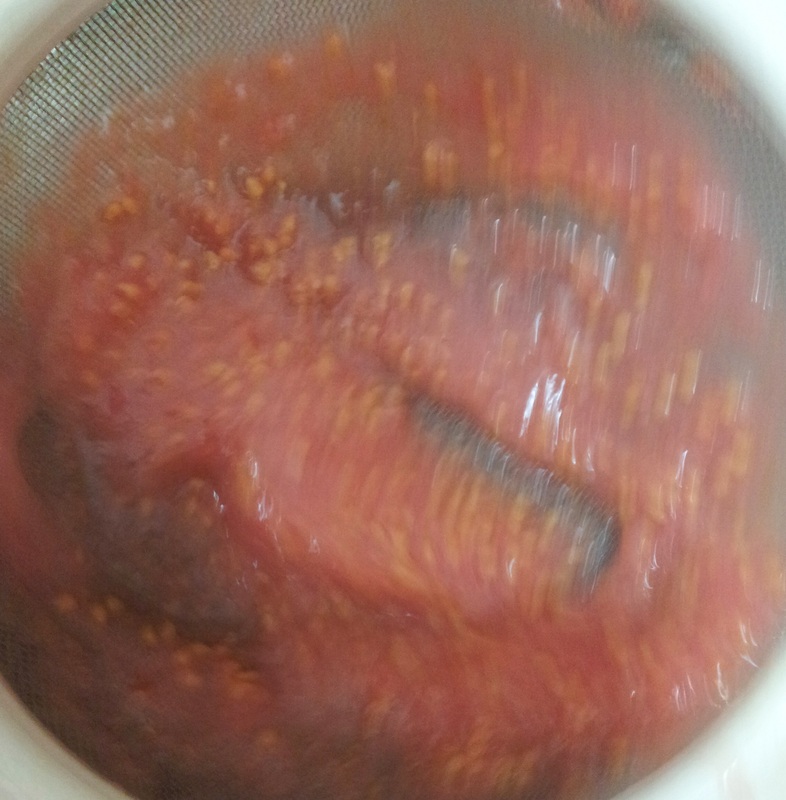 The next step is to put the juice through a sieve and mash all the pulp out. This process also removes the seeds, which by the way are as hard as little pebbles. Look at all of those seeds! I also decided to add some papaya. This is something I wish I liked more, but I can’t get over the smell. The color, on the other hand is something that I love! I put it in smoothies because it’s supposed to be SO good for you. 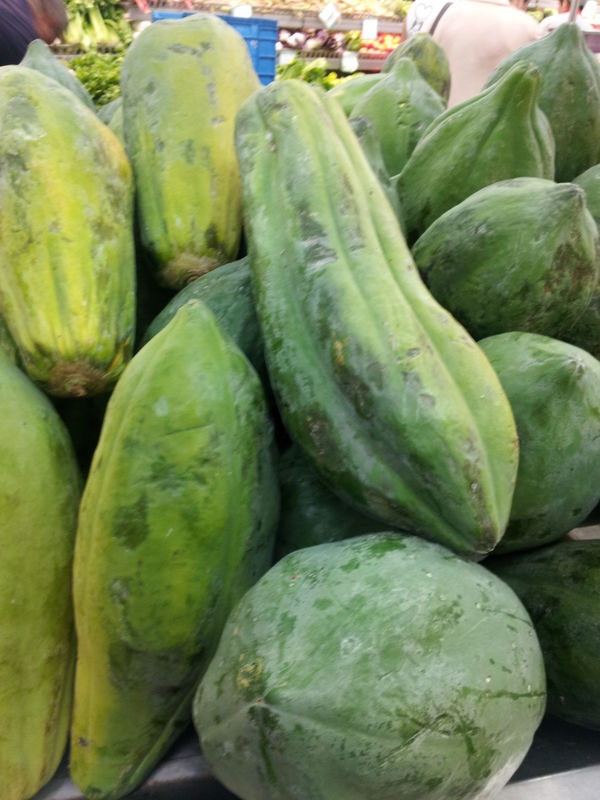 A bin full of papayas. The last thing I put was an apple. I had no idea if this combination would work, but I thought, What the hell? It won’t be that bad. The tart component to balance the sweetness. And it wasn’t! Actually, it kind of tasted like a mild bubble gum. I think next time I’m going to add passion fruit to my guava juice. You know, there are a million different possibilities here! Two fantastic things have happened this week. One, we finally bought a car (this is the miracle) and two, we finally made it to the Chacao food market before closing time. It normally closes before 2 on weekdays, but we went on a Saturday before noon. This was both good and bad. 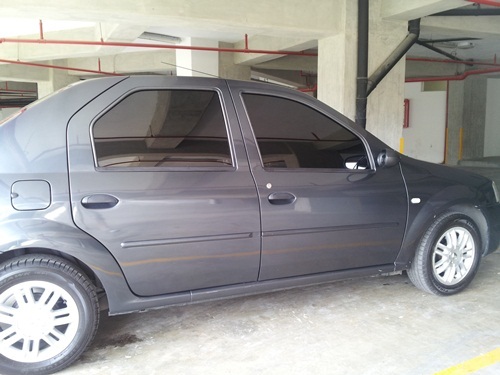 I’ve written before (A Lesson in Patience) about the incredible difficulties of finding a car here in Caracas, so it was with great fortune that a friend of a friend of Juan’s sister was selling one. Did you get that? That’s the most trusted way of doing business here. If you know the person, or they come recommended, the chances of a smooth transaction are high. I’ve also mentioned that gas here is, for all intents and purposes, free. Let me put it this way, a can of coke is more expensive than a TANK of gas. The subsidization of gas here is, for lack of a better word, strange. 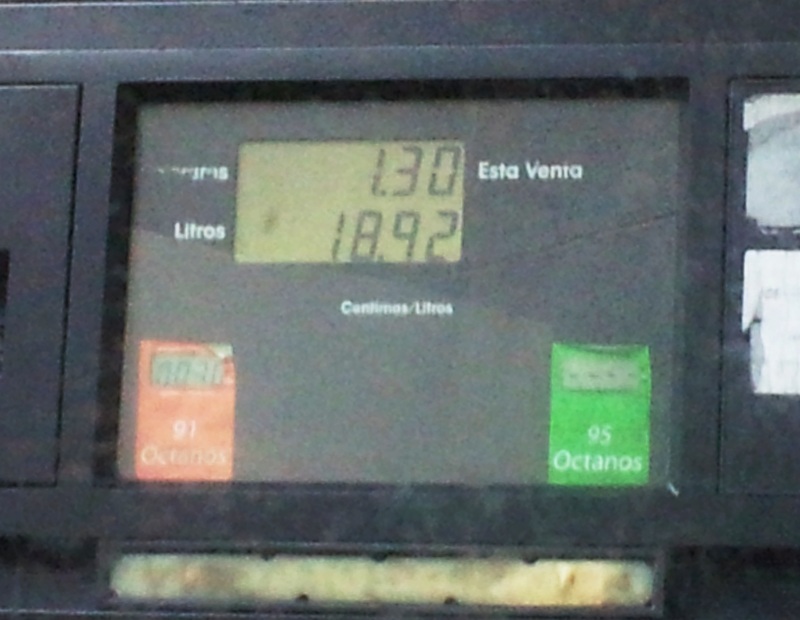 I know every country has their issues, but for a country that has millions upon millions of people living below the poverty line the best it can do is give away gasoline? Ahhhh, my brain goes in circles considering this here. I struggle to understand the why’s and how’s of it. I think I’ll leave it for another day. Having a car is another piece of the puzzle falling into place. It’s funny, Juan and I have always tried to live in cities where we wouldn’t be car dependent. You know, live in a place where we could easily commute using great public transportation. Montreal, by the way, was the best to date offering city dwellers and tourists alike the metro (a subway), buses, and the Bixi (a bike rental service where you can rent by the hour or the season). Bixi = bike + taxi. It’s genius. Fortunately, and unfortunately, a car here means freedom!! We no longer have to borrow Juan’s mom’s car (I’m pretty sure she loves her renewed freedom) and there is no need to plan; we can just get up and go. The unfortunate part is that we’re adding to the already overly polluted city. I guess I feel somewhat better knowing that the car is only a few years old. The emissions are low, so it assuages my guilt. We bought the car sight unseen (crazy prospect, isn’t it? ), so once it was in our possession Juan wanted to test it on the highway. This was relatively easy seeing how there was a mass exodus out of the city for those wanting to celebrate carnival. I tested it as a passenger, checking the windows, air conditioner, the seats etc. I remarked that we will never, ever have to use the heater!! I giggle at this. Tee hee. Juan will be the principal driver here for two reasons: one, I’ll never drive in the city (it’d be suicide for me or manslaughter for someone else) and two, it’s a stick shift. I never learned to drive one. I’m kind of kicking myself for that, but I learned to drive on my first cross country Canada trip. The huge camper van we had was automatic. I’ll learn to drive it once we get to the island. It’ll be good fodder for a post. Anyway, once we finally made it to Chacao (a neighborhood) we needed to find parking. Parking on the street in Chacao is safe, but Juan wanted to park in the market’s parking lot. Parking lots here could also be another blog post, needless to say, one needs patience. Seeing how I don’t have a lot of that, I left Juan to find his way while I went in search of some goodies. Upon entering the market I made a mental note, not to ever go there on a Saturday again or at least come earlier in the morning. We had planned on the latter, but Juan’s test drive took us a bit further than we had anticipated and into a shady neighborhood, one I was anxious to get out of. No pictures were taken there. I digress. The market was loud and lively. This was due in part to a mini carnival parade (percussion section included) making it’s way through the stalls. I love markets. 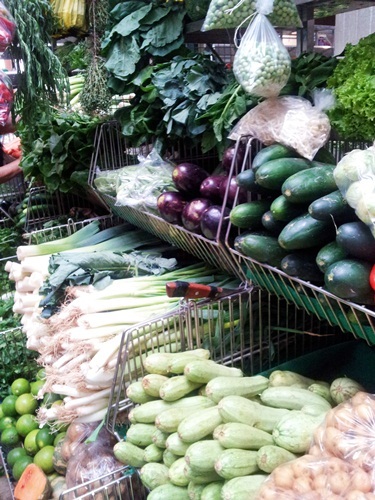 I could spend hours looking at every fruit, vegetable, herb, and knick-knack. Juan, not so much. So I used this opportunity (of not having him around for 10 minutes) to discover things he’d walk past. 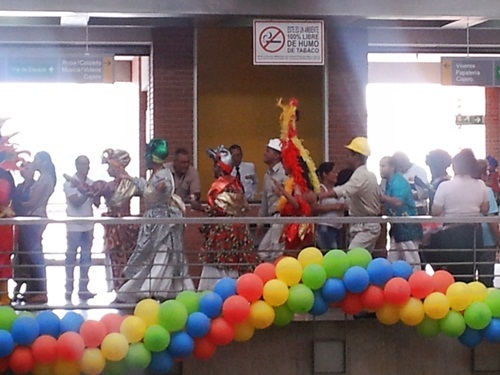 A carnival parade through the market. Not having him around also allows me to practice my Spanish. I found a store that was just up my alley. It had teas, and natural products, and really kind people. I could tell immediately that they would be patient with me, so I asked a lot of questions, even about things I knew the answers to. I ended up buying some jasmine rice (which is hard to find here), some dried lavender and some pomegranate suckers. The best find/deal for me were the wooden spoons. I’m a tactile person. I love the way things feel. I have to touch things in order to know them better. These spoons are so smooth and the colors are so rich. I just stood there and rubbed all of them. You know, to feel which ones were the best. The prices were shamelessly low, so of course I had to buy them. 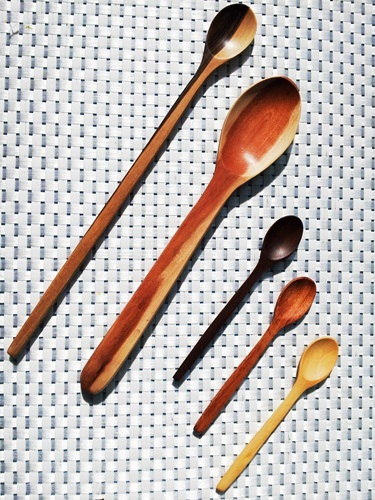 My new collection of wooden spoons. The long one is going to be used for mixing drinks! After wandering around for a bit, it was time for a little coffee. Again, the people were super friendly. While waiting for our order, Juan had me try a little bit of hot sauce that was sitting on the counter. I love hot sauce. So much so, that I think I must have been Mexican in another life. This hot sauce was nothing like I have ever tasted!! It was not just hot and spicy, the flavor was really complex. I mean layers of complexity. It was phenomenal. My mouth was so happy! Juan turns to me and says, so do you want to know what’s in the sauce? I look up to where the bottles were sitting and I could see an ant on the label. Strangely, I wasn’t disturbed my this. It was more fascination. I mean how could something like an ant taste so damn good?! The spicy ant salsa. It is also used as an aphrodisiac, or so they claim! The formic acid, the same acid that stings you when it bites, is what gives it flavor. Of course there is also garlic, pepper and salt added, but it’s the acid that makes this salsa spectacular. I have a feeling the kind of ant has something to do with it as well. 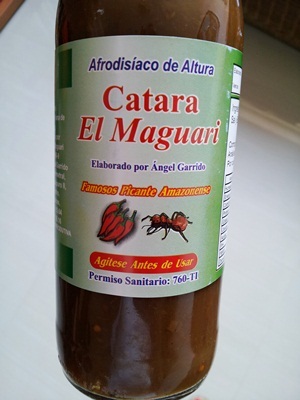 This particular salsa is made from ants from the Amazon. I’ve seen them and they’re huge! Once home, I told a friend about my new culinary discovery and she couldn’t wrap her head around eating bugs. I understand her squeamishness, but it has opened a new world for me. I can’t wait to use this as a marinade. A bachaco. 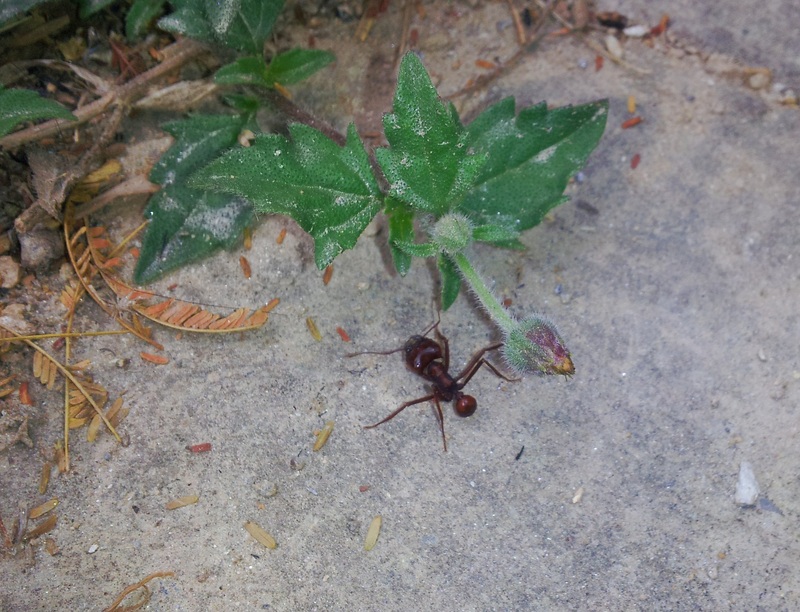 The same ant found in the salsa. Look at the size of it. It’s huge! Something strange happens here on Sundays, people slow down. It’s like they take a deep breath before the start of a new week or perhaps they have no energy from the week that has passed and just decide to go with it and relax. This doesn’t mean they stay at home and don’t do anything, on the contrary. It appears that everyone heads outdoors to spend time with family and friends. View of the Avila from Parque El Este. 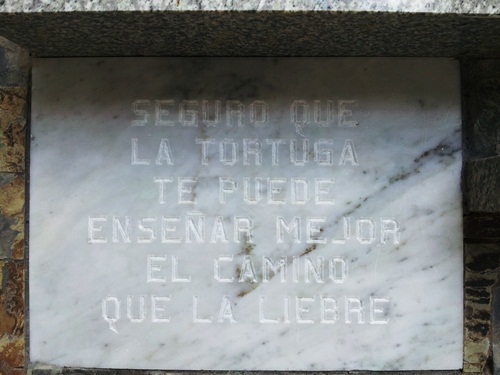 Two fantastic places to do this are Parque El Este and the Avila National Park. Both, conveniently enough, are located in the city. Because everyone has the same idea, there are some serious lines to get into and out of Parque El Este. It’s a super crowded place on the weekend. Every group imaginable is there from yoga, tai chi, some sword fighting group, I even saw a wellness group where people were laughing so hard it was contagious. There are, of course, the walkers, the joggers, and basketball, volleyball and baseball players along with kids in strollers. Everyone is trying to get the most of the fresh air and their one truly free day. There are kiosks of toys for kids, people pressing fresh orange juice, or serving chicha ( a semi-thick rice drink, not to my liking), there are even canteens selling empanadas and taquenos (I’ll write more about those when I have pictures of the good stuff!). 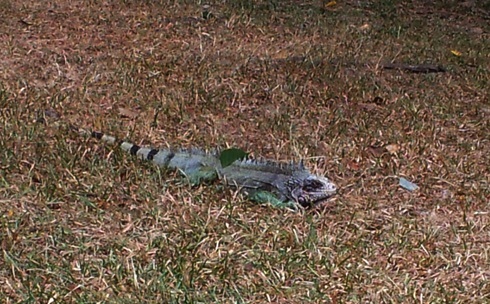 A 2 foot long wandering iguana. Parque EL Este is not a zoo even though it has some crocs, lots of turtles, a couple of monkeys, a few otters, and the odd large iguana running around. I particularly like watching the monkeys, but I love watching other people react, or not, to animals, especially children. 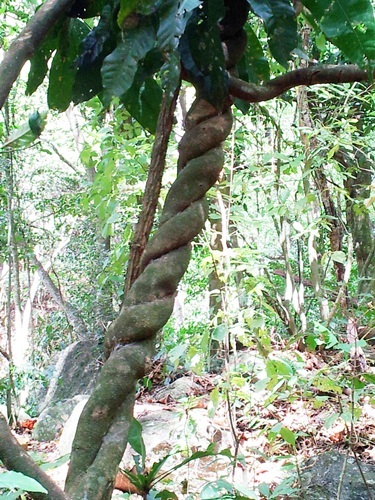 People connect to nature differently than how they connect with people. In some ways it gives me hope. Taking a sip of water. I’m all about stopping and smelling the roses. Seriously, I think Juan gets tired of me picking up random things like seeds, or fruit from a tree, or feeling the texture of bark on a tree. 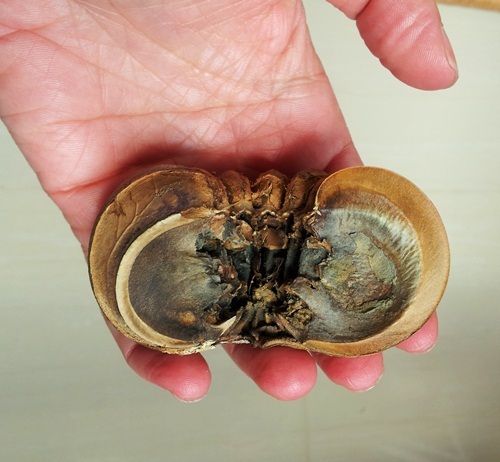 Take the Hura Crepitan seed for example. It stopped me in my tracks. 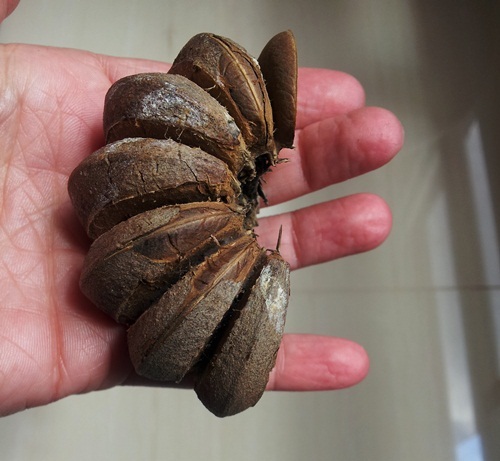 It’s a big, hard seed which, when whole, kind of looks like a small brown pumpkin. Juan told me that people here make jewelry, key chains, or even art with them. 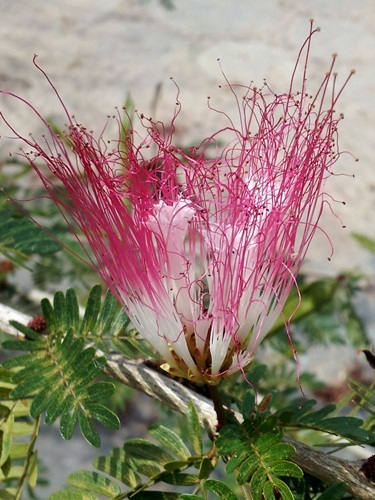 The tree is also referred to as the Dolphin tree because when you turn one part of the seed a certain way it looks like a dolphin. I think I’m going to try and make something out of mine. By the way, the trunk has thorns like a rose. Crazy, right? Anyway, I like details; I like that I can think about shapes, forms, the how and the why of things. It gets my mind working and it calms me down. Nature is awesome! After visiting Parque El Este we headed over to the Avila National Park for a little hike. 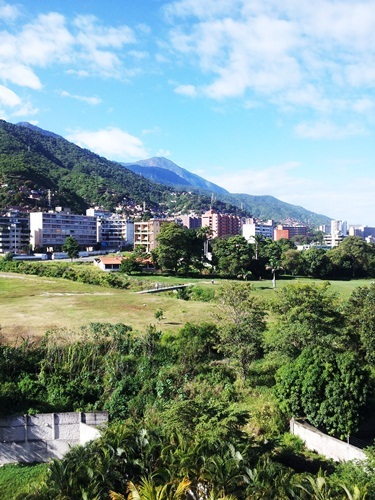 The Avila is the mountain range that dominates all of Caracas. It’s a large dark green curtain of a mountain. It’s beautiful. The beginning of our hike was, you guessed it, crowded. People with dogs, bikes and kids crammed the entrance. A few minutes later we were in our own little world. We went off of the beaten track onto a small trail. 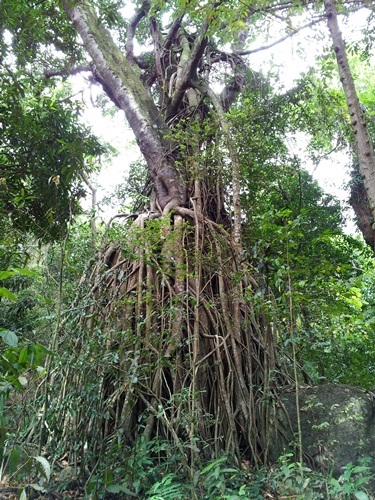 A whole lot of roots. The silence was most welcoming. It was hard to believe that solitude could be had in such a noisy city. I love this mountain for this reason. The air was pure, so clean. Caracas, unfortunately has no real air quality control, so cars, buses, trucks and motorcycles pollute in such a careless way that it breaks my heart. Huge black clouds of exhaust are everywhere. Whenever we walk around for any length of time my nose and throat burn. It’s that bad. So the Avila really is the lung of the city. All I can say is thank god trees turn carbon dioxide into oxygen! If not, we’d all be dead from poisoning. 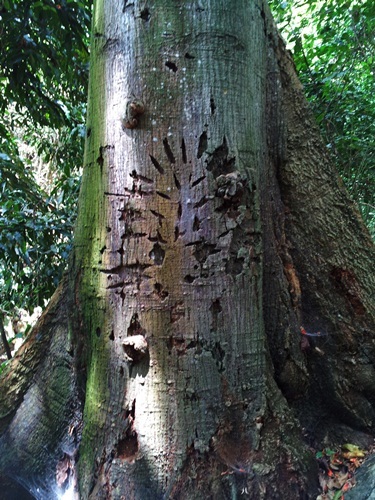 I call this the Pimple tree. 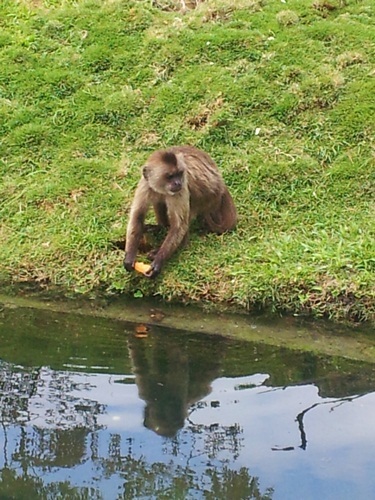 Walking through the Avila provided me with a great experience to discover new Nature. I saw trees and leaves that I had never seen before. 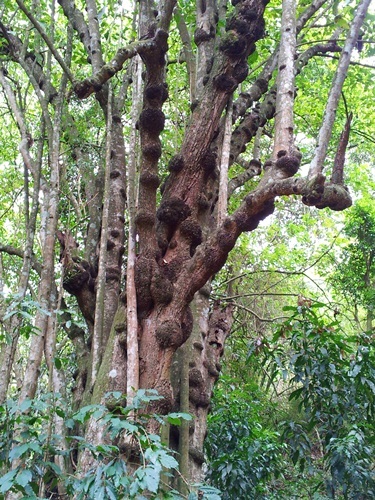 I call this the Face tree. It gave me a chance to unwind, be at peace and reconnect with the most basic of things: silence, light, shadows, chirping birds and the sound of water pushing its way through rocks. All in all, it was a fantastic way to spend a Sunday. 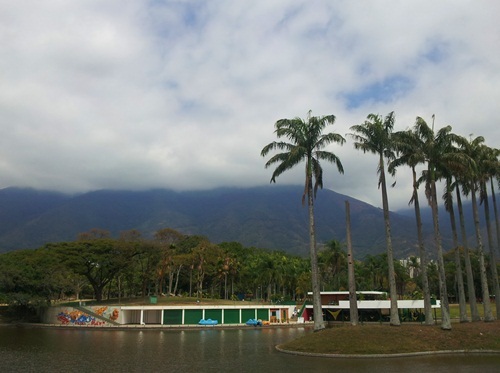 So if you ever find yourself in Caracas and need a break, head to the parks! 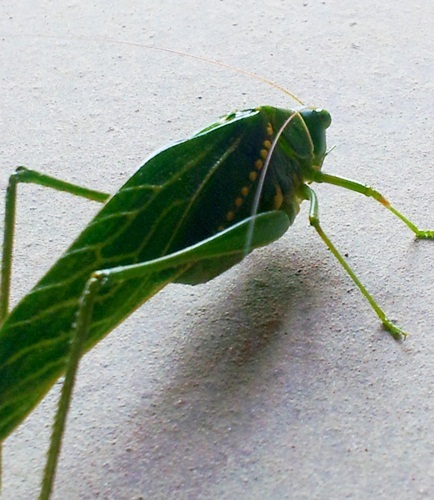 I love the contrast of the green and yellow of this grasshopper!